In the same way that no part of Britain can honestly assert that it was immune from, or untouched by, the events of World War II, so too there cannot be many parts of Britain, especially on a geographic scale of only 15 miles long by 5 miles across at its widest, that can claim to have witnessed greater and more-varied military involvement than the tiny Isle of Bute (click for location map), strategically snuggled amongst neighbouring islands and mainland peninsulas in the western waters of the Clyde Estuary. Yet the historical record, which has heroism, sacrifice, ingenuity, commitment and compassion emblazoned across it, had become increasingly at risk of fading irretrievably into oblivion. It is in this context, of a spectacular story to be told and an imperative that it should never be forgotten among succeeding generations, that an application was made to the Heritage Lottery Fund to seek funding for a programme of events to commemorate Bute's wartime involvements, as part of Britain's 60th Anniversary of V-Day celebrations in 2005. The Lottery's "Home Front Recall" Fund very generously allocated a sizeable sum to Bute's commemoration programme, and the establishment of the predecessor of this website (now much expanded) was just one of the many projects for which funding was approved. 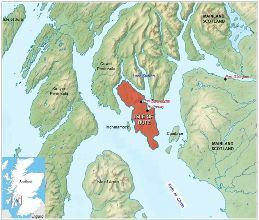 Its purpose is to communicate Bute's story to as wide an audience as possible, and to facilitate people sharing their wartime experiences and accounts of happenings on Bute. for their generous support for our island's 60th V-Day Anniversary programme of commemoration. 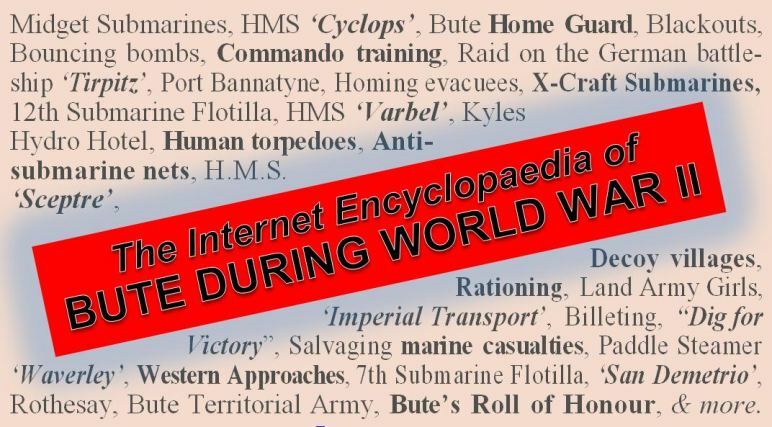 DISCLAIMER: Although the content of this website has been researched with the utmost care, any liability on the part of 'Bute-at-War', or any other individuals involved with the website's development, arising out of any inaccuracies contained in material produced for this website (including its forums) or in linked websites, is expressly excluded. Copyright © , 'Bute-at-War', All Rights Reserved.